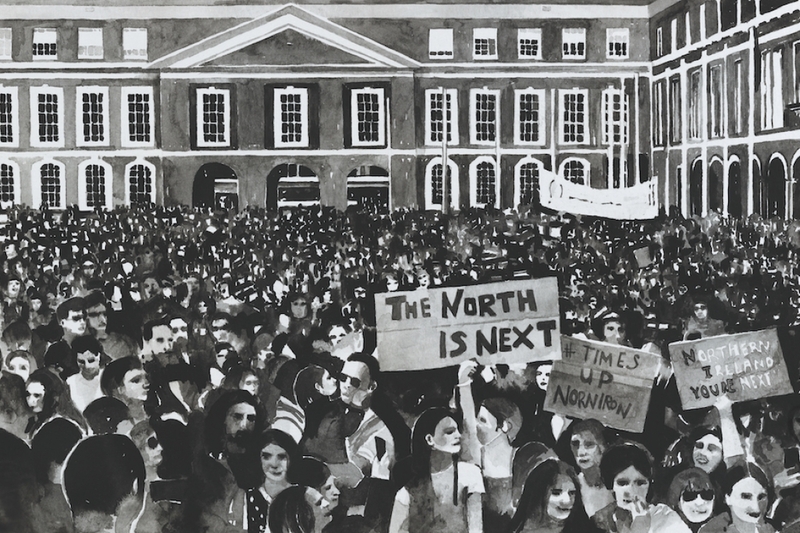 For SUPERMARKET 2019, Ormston House presents a solo exhibition by Joy Gerrard featuring new Brexit protest drawings alongside images from the Repeal the 8th campaign in Ireland. These works will be shown with a large site-specific, performative drawing that Gerrard will work into for the duration of the independent art fair in Stockholm. This work will be an abstracted protest work that will utilize print, repetition, fracturing, cutting and painting in both its making and eventual destruction. Joy Gerrard archives and painstakingly remakes media-borne crowd images from around the world. Drawing on over a decade of image-making and research on themes of protest and urban space, her most recent work documents huge protests against Brexit in London from June and September 2018. With these specific pieces, Gerrard pushes a monochrome palette to think about the binary nature of contemporary politics in the UK. In 2019, politics is in constant flux as the UK parliament attempts to find a solution to the conundrum that is Brexit. Viewed from above, Gerrard’s protest crowds suggest the removal of media observation, while the fluidity and drama of their moment is expressed through precise, expressive mark-making. She works with film and exhibits large monochrome paintings and small complex drawings, both made with Japanese ink. The large paintings allow a shift in scale, disrupting the photographic schema of the smaller drawings, thus allowing greater freedom from the original mediation of the image. SUPERMARKET (Stockholm, Sweden) is an international artist-run art fair that provides a showcase of artists’ initiatives from all over the world with the aim to display their unique projects and ideas, to create opportunities for new networks on the international art scene, and to share the passion and vitality that are present in this sphere of the art world. Ormston House’s participation at SUPERMARKET 2019 is kindly supported by Culture Ireland. Image: The North is Next by Joy Gerrard, 16:9 billboard & giclée print, courtesy of the artist. Our presentation at SUPERMARKET 2019 was selected through our Membership Scheme. For future opportunities, you can join for free here.